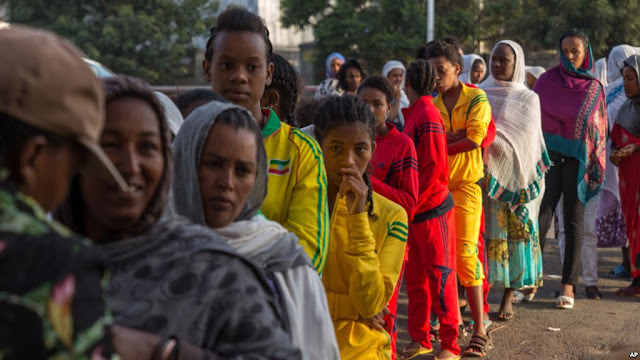 Voters queue early in the morning to cast their votes in Ethiopia's general election, in Addis Ababa, Ethiopia, May 24, 2015. VOA News ADDIS ABABA, ETHIOPIA— Ethiopian opposition parties did not manage to break the rule of Ethiopia’s ruling party last month or receive a significant amount of seats in parliament. It complained of harassment, intimidation and vote-rigging during the May election in which the ruling party probably won all of the parliament seats and another five years in power. The opposition Ethiopia Democratic Party claims the pre-election process was not fair and the election results are not credible. EDP Executive Committee member Wasihun Tesfaye feels there is a deadlock in the current multi-party system, but said the opposition will continue. “After 24 years, the opposition suffered many challenges, [but is] still alive. The next five years or the next 10 years [for] the Ethiopian opposition camp, present a danger,” said Wasihun. Ethiopia often is applauded for its economic growth numbers, but also is frequently criticized for its human rights record. Fifty seven political parties participated in the May elections, but there still are many outlawed armed groups fighting the government that has been in power since 1991. Oromo Federal Congress chairman Merera Gudina is the vice chairman of Medrek, a coalition of opposition parties. He said if the peaceful struggle is not working, other forces can gain an upper hand in the political landscape. “When the so-called peaceful struggle is not delivering anything big, then the young people really desperate for change they can jump to anywhere," said Merera. "I am afraid that the Ethiopian politics can take in a more violent form than what we are observing now. I think that especially the government should think twice in strategy of suffocating the moderate and peaceful voice, and what it can get is definitely the more militant response,” he said. The government came to power after a 17-year guerilla war that overthrew the military junta. None of the opposition parties feel they have to adjust their strategy or change their message. They accuse the government of vote rigging and many refused to call the voting in May a real election. The opposition leaders believe they have the support of millions of Ethiopians and will continue raising awareness in the country. The newest opposition party during these last elections was the Blue Party. Chairman Yilkal Getnet said he believes Ethiopia has not transitioned to a democracy, calling the current government a dictatorship. The 2005 elections were significant in Ethiopia’s recent history as opposition parties felt they were given the freedom to campaign. Initial results showed a significant win for the opposition who accused the government of stealing the elections when final results were announced. This led to mass demonstrations in which almost 200 protesters were killed and thousands were arrested. Ethiopia’s Peoples Revolutionary Democratic Front won all but one seat in parliament during the 2010 elections, and this time they might have won 100 percent of the seats. One constituency still needs to be counted, but of the 547 seats, 546 have been won by the EPRDF and its affiliates.